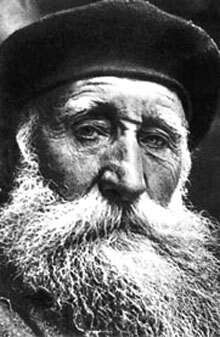 Aristide Joseph Bonaventure Maillol (French: [mɑjɔl]; December 8, 1861 – September 27, 1944) was a French sculptor, painter, and printmaker. Maillol was born in Banyuls-sur-Mer, Roussillon. He decided at an early age to become a painter, and moved to Paris in 1881 to study art. After several applications and several years of living in poverty, his enrollment in the École des Beaux-Arts was accepted in 1885, and he studied there under Jean-Léon Gérôme and Alexandre Cabanel. His early paintings show the influence of his contemporaries Pierre Puvis de Chavannes and Paul Gauguin. Gauguin encouraged his growing interest in decorative art, an interest that led Maillol to take up tapestry design. In 1893 Maillol opened a tapestry workshop in Banyuls, producing works whose high technical and aesthetic quality gained him recognition for renewing this art form in France. He began making small terracotta sculptures in 1895, and within a few years his concentration on sculpture led to the abandonment of his work in tapestry. In July 1896, Maillol married Clotilde Narcis, one of his employees at his tapestry workshop. Their only son, Lucian, was born that October. 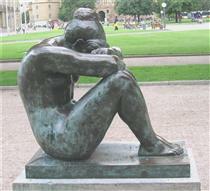 Maillol’s first major sculpture, A Seated Woman, was modeled after his wife. The first version (in the Museum of Modern Art, New York) was completed in 1902, and renamed La Méditerranée. 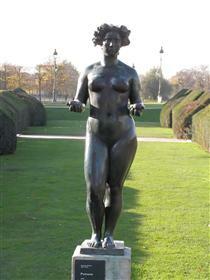 Maillol, believing that "art does not lie in the copying of nature", produced a second, less naturalistic version in 1905. In 1902, the art dealer Ambroise Vollard provided Maillol with his first exhibition. The subject of nearly all of Maillol's mature work is the female body, treated with a classical emphasis on stable forms. The figurative style of his large bronzes is perceived as an important precursor to the greater simplifications of Henry Moore, and his serene classicism set a standard for European (and American) figure sculpture until the end of World War II. 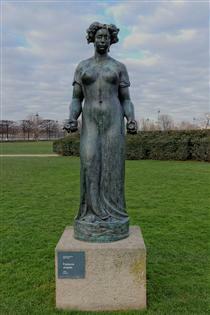 Josep Pla said of Maillol, "These archaic ideas, Greek, were the great novelty Maillol brought into the tendency of modern sculpture. What you need to love from the ancients is not the antiquity, it is the sense of permanent, renewed novelty, that is due to the nature and reason." Maillol served as a juror with Florence Meyer Blumenthal in awarding the Prix Blumenthal (1919–1954) a grant awarded to painters, sculptors, decorators, engravers, writers, and musicians. He made a series of woodcut illustrations for an edition of Vergil's Eclogues published by Harry Graf Kessler in 1926–27. He also illustrated Daphnis and Chloe by Longus (1937) and Chansons pour elle by Paul Verlaine (1939). He died in Banyuls at the age of eighty-three, in an automobile accident. While driving home during a thunderstorm, the car in which he was a passenger skidded off the road and rolled over. 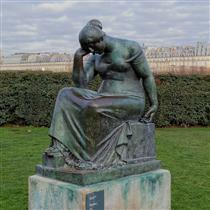 A large collection of Maillol's work is maintained at the Musée Maillol in Paris, which was established by Dina Vierny, Maillol's model and platonic companion during the last 10 years of his life. 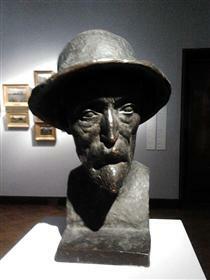 His home a few kilometers outside Banyuls, also the site of his final resting place, has been turned into a museum where a number of his works and sketches are displayed.